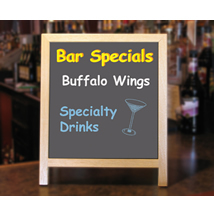 Table top Double Sided A-Frame boards are a great in store marketing tool which can be used to communicate messages up close to your customers. They can be conveniently used in any number of places including displays and tables. Place in your specialty supermarket, retail store, or bakery. Constructed with a solid Oak frame and finished with an attractive clear lacquer that will blend with almost any decor. Available with a Black Chalkboard or a White Markerboard insert. 12" x 14"